The Korean government is well aware that legalizing consumption and production of dog meat will only make the situation worse. The government has been neglecting the problems arising from the dog meat industry instead of solving the barbaric animal cruelty inflicted on the dogs in this illegal industry. As seen from the dogs being transported from Jeju to mainland S. Korea, this kind of extreme animal cruelty is still rampant. All dogs have the right to be loved as sentient beings, but unfortunately, all dogs in this case experienced a long, painful journey from Jeju Island to the mainland. The Korean Animal Protection Law was recently revised to protect animals and to provide safety for their vulnerable lives. However, this law isn’t enforced and therefore the consumption, production, and trade of dog meat must be eradicated. Some dogs are lucky enough to live their lives with humans as companion animals and as part of the family. Unfortunately, at the same time, many dogs are abandoned by their owners on the street, picked up off the street by the dog meat traders, and thrown into cages where they have to live in wire cages for the rest of their lives, awaiting an excruciating death. The so-called dog-meat dog is called Nureongi or Hwangu, which means yellow dog. These dogs are considered a kind of “livestock” breed. However, they are just like any other dog. It should also be noted that any dog from any breed can end up as dog meat. An average figure is around 2.50 million dogs. Around 93,600 tons is supposedly used for making tonics. Hard to get a definite figure. In 1998 there were 6,484 registered. Sources often say around 4,000 to 6,000. However, an estimate of the actual number restaurants is around 20,000. Figures vary widely. A small percentage would eat it regularly. This would be people in the older age bracket. Some say around 30% of Koreans have tried it, while others say around 60%. 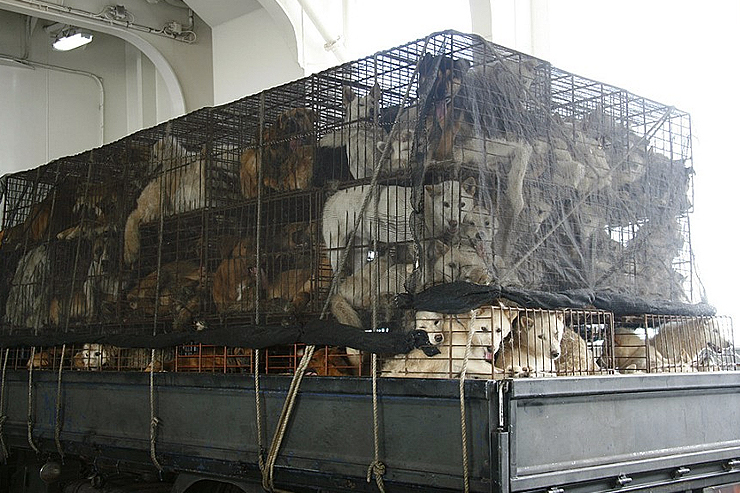 Another survey found that 42% of respondents ate dog meat. Inconclusive. According to one source, a Ministry of Agriculture survey found that 59% of under 30-year-olds would not eat dog; 62% of under 30-year-olds regarded dogs as pets and not food. In one survey, around 85% of people surveyed did not think dog eating should be eradicated (this figure is arrived at by added together the 42% dog meat eaters and 43% non-dog meat eaters in the survey that supported dog meat eating). This figure seems dubious. In Journal of Social Issues, Vol. 65, No. 3, 2009, pp. 615–632, it shows survey results on the attitudes to the uses of dogs. “Respondents were in favor of using dogs as pets or companions (60% tended to or strongly approved), but themajority were against the use of dogs as food for humans (55% tended to or strongly disapproved). Pet owners were not significantly more likely to disapprove of using dogs for food than nonpet owners (58% compared with 53%, respectively).” So, the majority of Koreans are against it but not by a large margin. Bosintang, it’s a kind of soup dish with chunks of dog meat. Sambok (Boknal): Chobok, Joongbok, and Malbok. These are based on the lunar calendar and supposedly coincide with the 3 hottest days of the year. They’re around the end of July and beginning of August.